GASSVILLE — A blurry apparition on the bottom of the White River has turned out to be treasure. 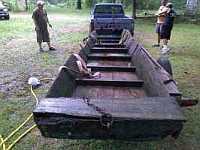 The river, at a spot known to locals as Red Bud above Rim Shoals, has yielded a boat that is 95 percent intact and dates to about 1929. 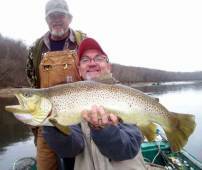 Mike Flippin, a lifelong fishing guide on the White, said Wednesday that he first spied the object that looked like a staircase on the river bottom in May. 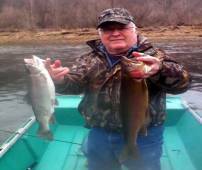 A regular angler on those waters, Flippin said he kept an eye on the object as the river level fell during the summer. On July 2, assisted by friends Eric Totty and Joshua Due, Flippin came prepared to raise the boat and inspect it closely. Very few examples of similar boats built in 1920s exist today. 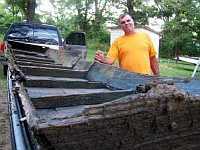 Flippin said he believes the boat he found may have originated from the Galena (Mo.) Boat Co.
Flippin said Ozarks researcher and author Larry Dablemont has written about the seven-day float trips from Galena to Branson and 14-day float trips from Branson to Cotter that were popular excursions in the 1920s. 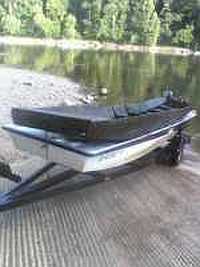 “These boats were taken out of the river at Cotter and carried by train back to Galena,” Flippin said. 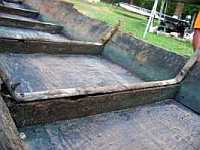 After raising the boat and taking it ashore, Flippin said he immediately re-immersed it inside a larger boat lined with heavy plastic and filled with a solution recommended for preserving wood that has acclimated to being underwater. He then called Julie Lovett, a Bull Shoals State Park interpreter, who estimated that, based on the style of nails use, the boat was built between 1927 to 1930. “I’m just tickled to death it’s out of the river and safe,” Flippin said. He said he hopes eventually to see the boat exhibited where the public can see and appreciate it for its place and purpose in history. Flippin said similar boats are on display at College of the Ozarks and Silver Dollar City. The Silver Dollar City boat is a new boat created by craftsmen in the style of the boats built commercially in the South by Charlie Barnes of Galena.